Two months after Obama was inaugurated, his face is making an endorsement for lending rates at a local bank. The two men are waiting for the arrival of the tram – which pulled up a few seconds after I took this photo. 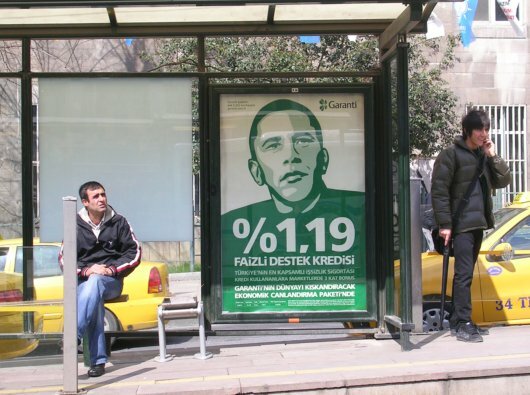 You can see part of Obama’s head in the window of Istanbul Passengers from my previous post. Linda Ciesielski is a recent graduate of the MIT’s Dept. of Urban Studies and Planning, where she received her Masters in City Planning with a focus in Environmental Policy and Planning. She received a B.S. in Landscape Architecture from Cornell University in 2005. This trip was her first time in Istanbul. For further inquiries about the work please contact lindac@mit.edu.